Landon Donovan has decided to come out of retirement and sign a contract to play for the LA Galaxy for the remainder of the year. 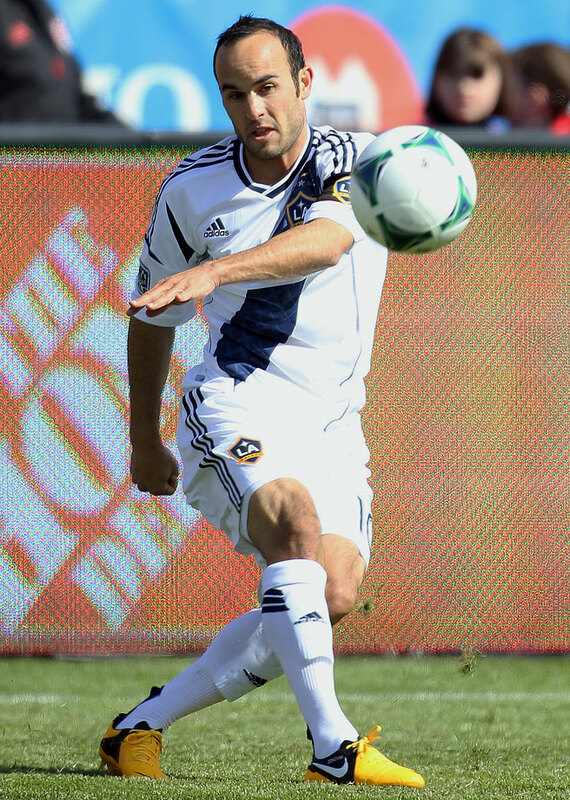 Donovan initially retired at the end of the 2014 season with the LA Galaxy, the team he had played for since 2005. He remains the all-time leading scorer for U.S. Soccer (57 goals) and Major League Soccer (144 goals) and is also the MLS all-time leader in assists (136). Since retiring, Donovan has remained close to the sport in a broadcasters role and most recently joined Swansea City in an ownership role. 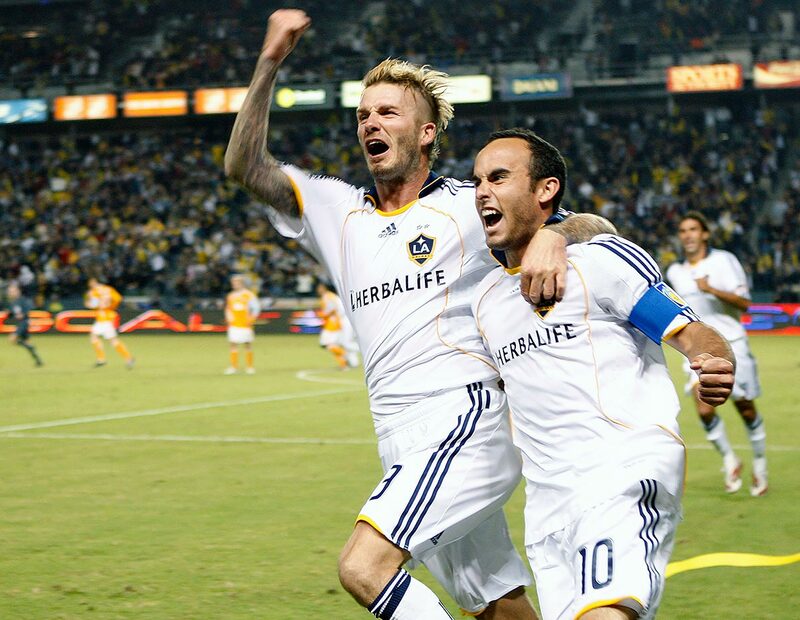 The Major League Soccer MVP Award was also renamed in his honor to the Landon Donovan MVP Award. A young Landon Dovovan poses in his youth soccer uniform. Landon Donovan and Julio Bracamontes of Mexico battle during the quarterfinals of the FIFA Under-17 World Cup in Auckland, New Zealand. The U.S. defeated Mexico 3-2. Landon Donovan runs through an agility drill at a practice session in Germany with Bayer Leverkusen. 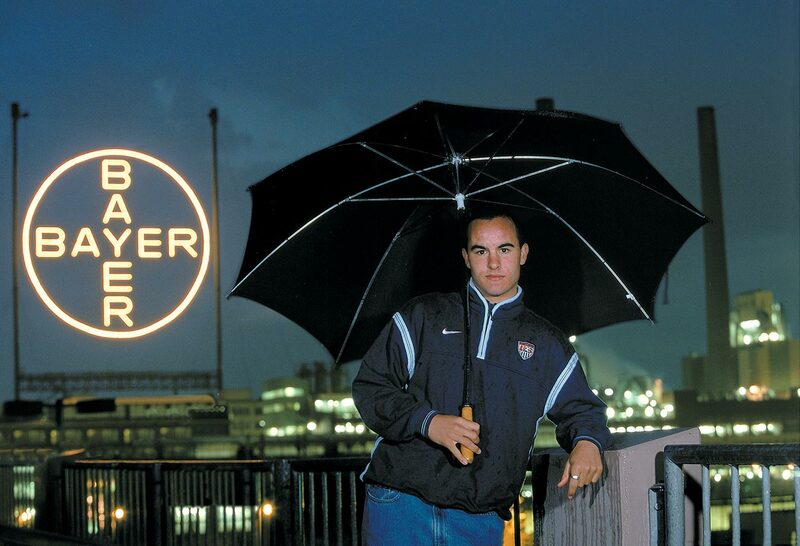 Landon Donovan poses in front of the Bayer pharmaceutical plant in Cologne, Germany. He had a brief stint with German Bundesliga side Bayer Leverkusen. Landon Donovan during a quiet moment with Bayer Leverkusen. 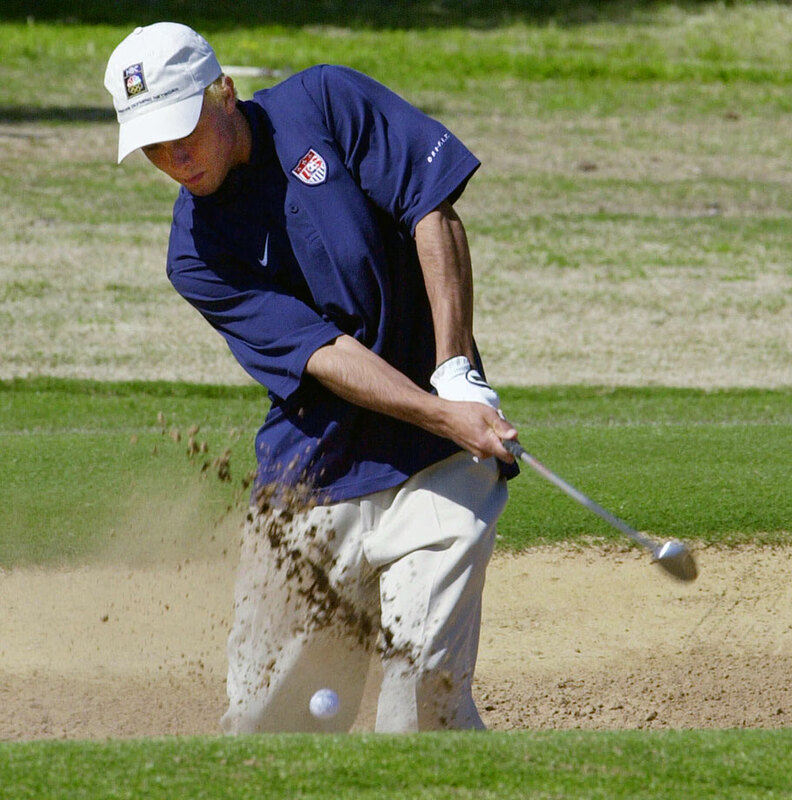 Landon Donovan hits out of a bunker while playing a round of golf in Adelaide, Australia, on an off-day before playing Japan in one of the quarterfinal matches of the Olympics. 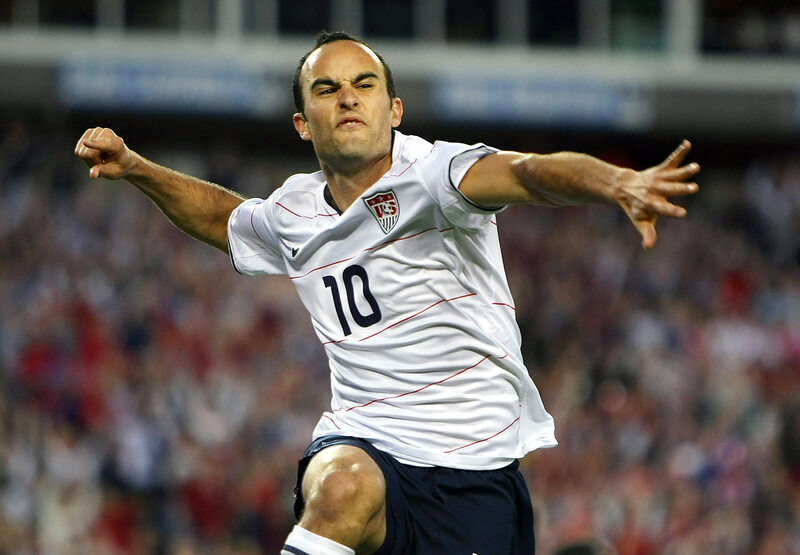 Landon Donovan runs after the ball during a game against Mexico at the Los Angeles Coliseum. The USA defeated Mexico 2-0. To honor U.S. Women's National Team member Brandi Chastain — who famously took off her shirt after winning the 1999 World Cup on a penalty kick — Landon Donovan pulled off his jersey to reveal a sports bra after he scored during the MLS All-Star Game in San Jose. 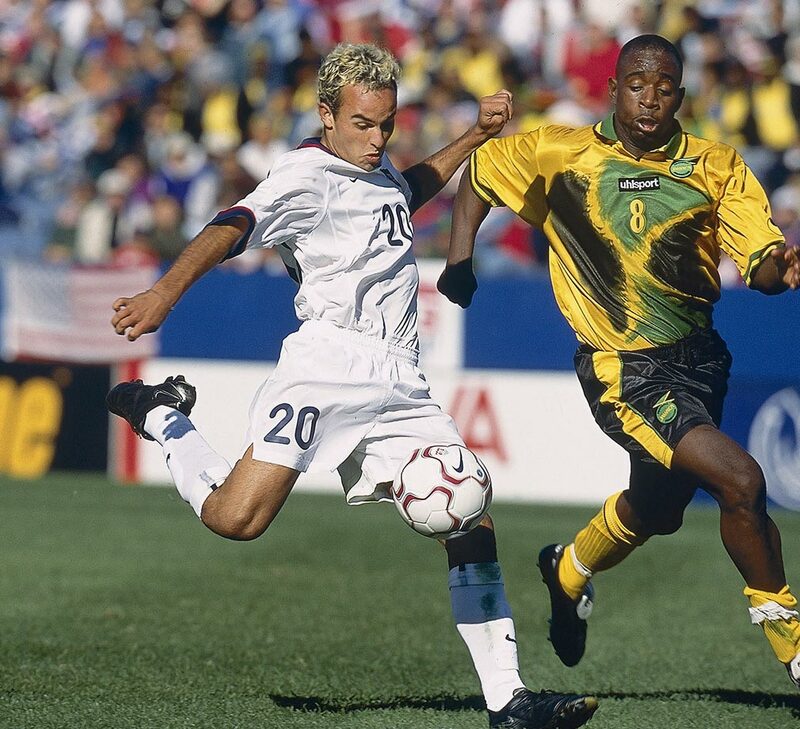 Landon Donovan gets off a shot as James Lawrence arrives too late to stop it during a 2002 World Cup qualifier against Jamaica. Landon Donvan chases the ball ahead of Danny Califf during the MLS Championship game between the San Jose Earthquakes and Los Angeles Galaxy at Columbus Crew Stadium in Columbus, Ohio. 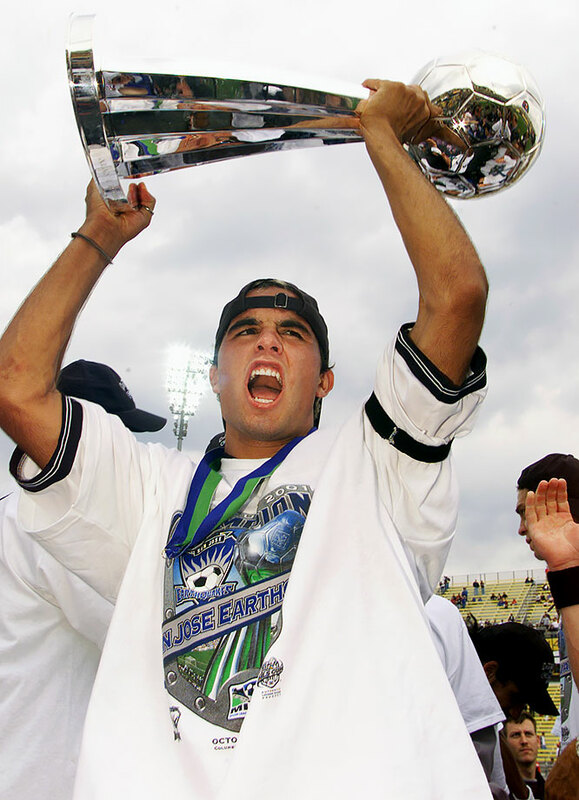 Landon Donovan hoists the MLS Cup trophy after the San Jose Earthquakes defeated the Los Angeles Galaxy 2-1 at Columbus Crew Stadium in Columbus, Ohio. Donovan scored the Earthquakes' first goal in the 43rd minute. Landon Donovan and DaMarcus Beasley pass the ball in a stretching drill at the Misari Football Center in Seoul, Korea. Landon Donovan records teammate DaMarcus Beasley during the national team's visit to the demilitarized zone. The U.S. soccer squad faced Portugal, South Korea and Poland in the first round of the 2002 FIFA Korea-Japan World Cup. 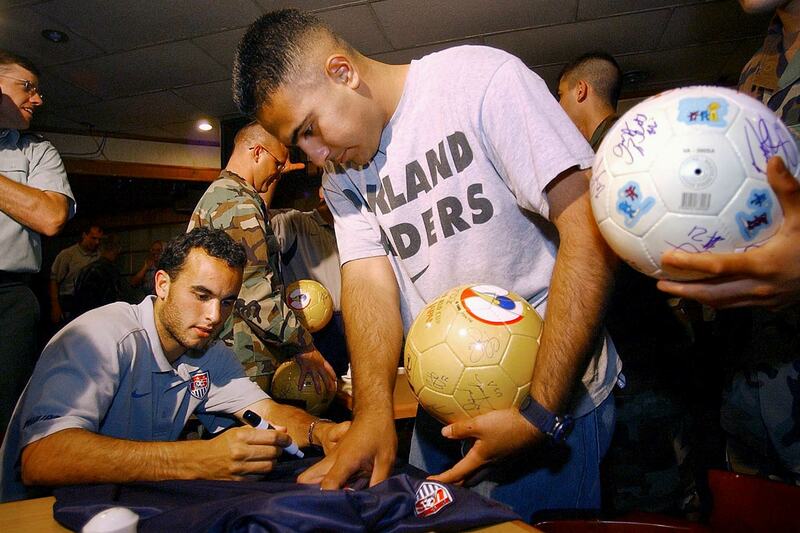 Landon Donovan autographs a USA team jersey for U.S. Army SPC 4 Jesus Medina of Houston during the team's visit to the demilitarized zone in Panmunjom, South Korea. Petit of Portugal holds back Landon Donovan during the second half of the their Group D match played in South Korea. The U.S. won 3-2. 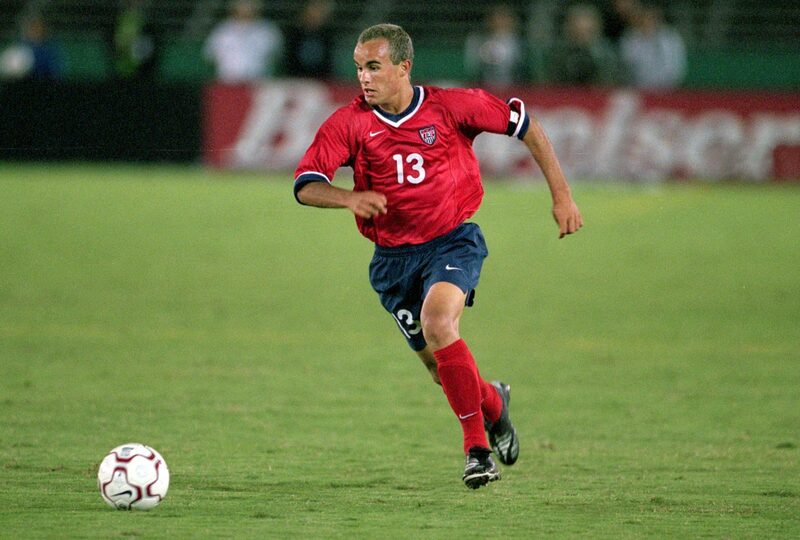 Landon Donovan plays the ball against Poland during the 2002 World Cup in Daejeon, South Korea. 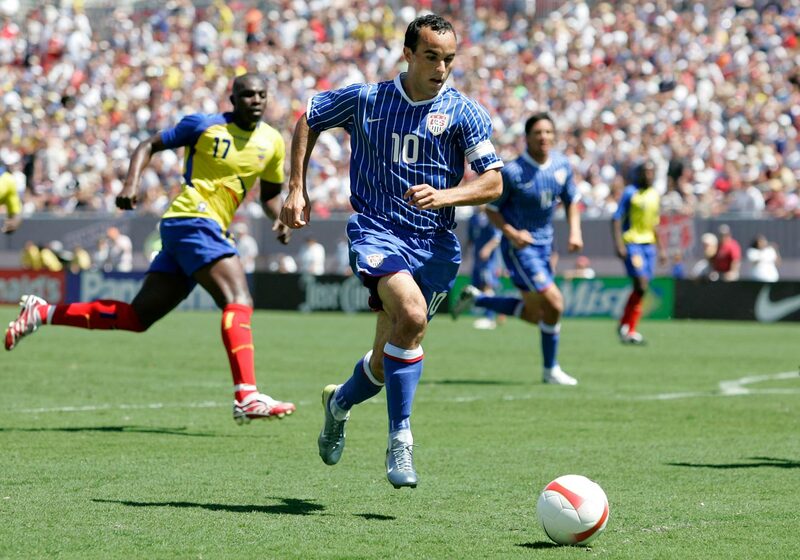 Landon Donovan celebrates following his 65th-minute goal during second-round playoff action against Mexico in the 2002 World Cup. The U.S. won 2-0. 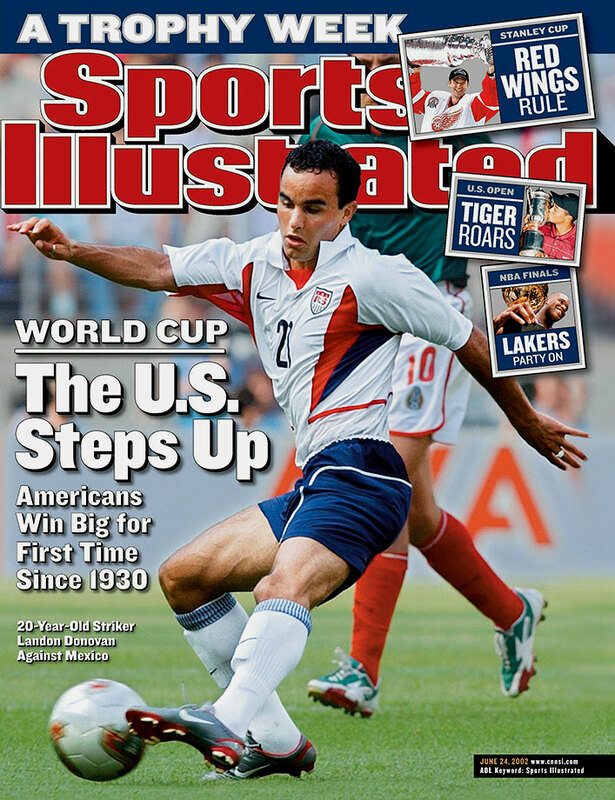 Landon Donovan on the cover of Sports Illustrated as the national team began play in the 2002 World Cup. 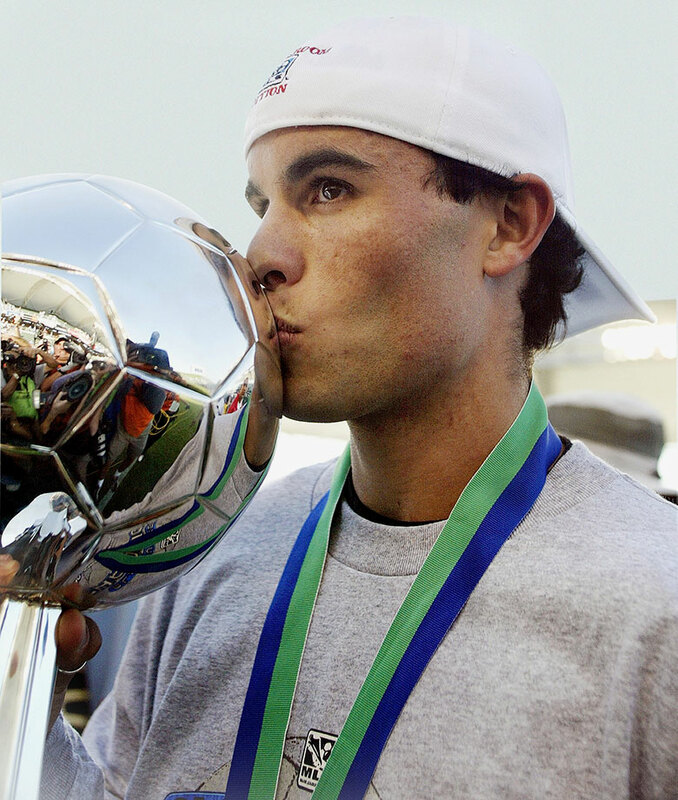 Landon Donovan of the San Jose Earthquakes kisses the MLS trophy after beating the Chicago Fire. 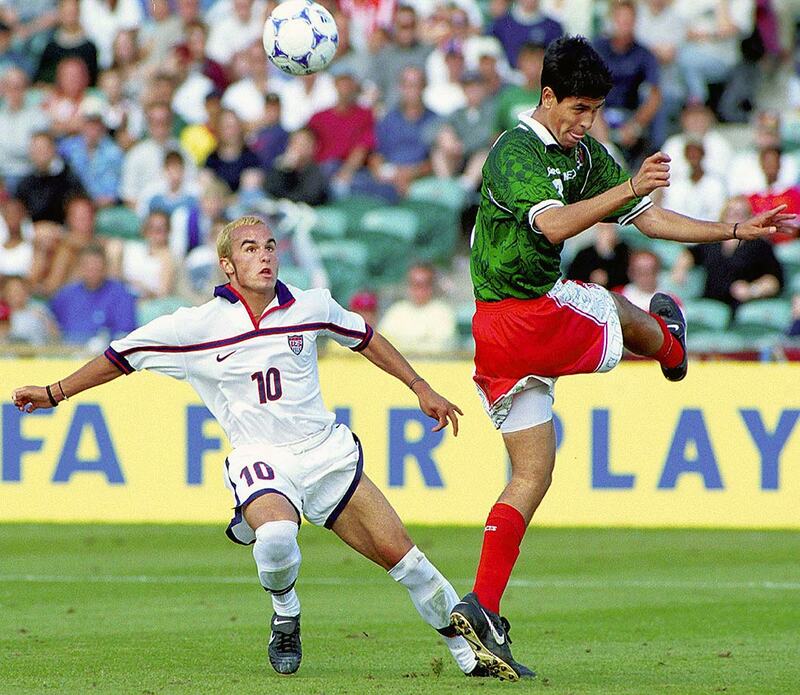 Landon Donovan moves the ball past Israel Lopez of Mexico during an International Friendly at the Cotton Bowl in Dallas. USA defeated Mexico 1-0. Landon Donovan played his fourth and last season with the San Jose Earthquakes in 2004. He made 87 appearances for them and scored 32 goals. Landon Donovan poses during a photo shoot on Manhattan Beach in Los Angeles. 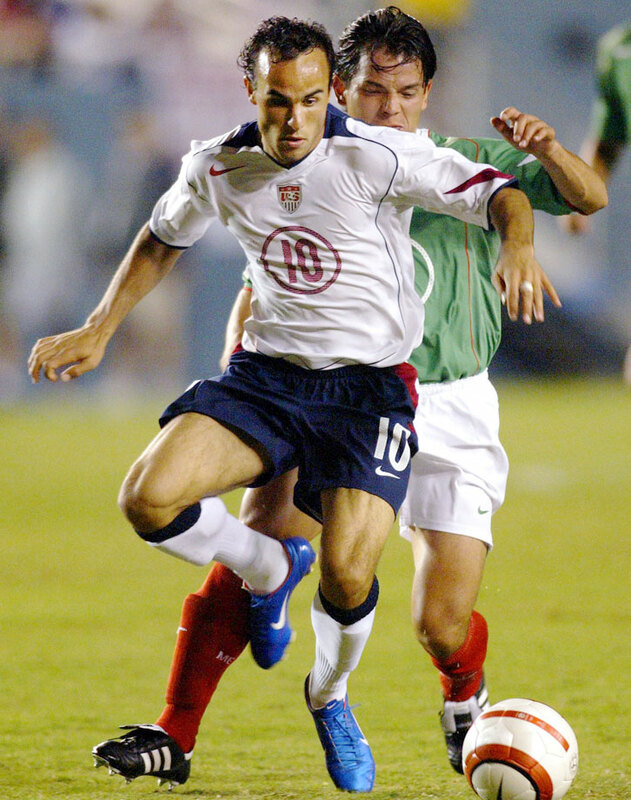 Landon Donovan in action against Mexico during a 2006 World Cup qualifier. Landon Donovan runs off the field holding an American flag after the U.S. defeated Mexico to advance to the 2006 World Cup in Germany. 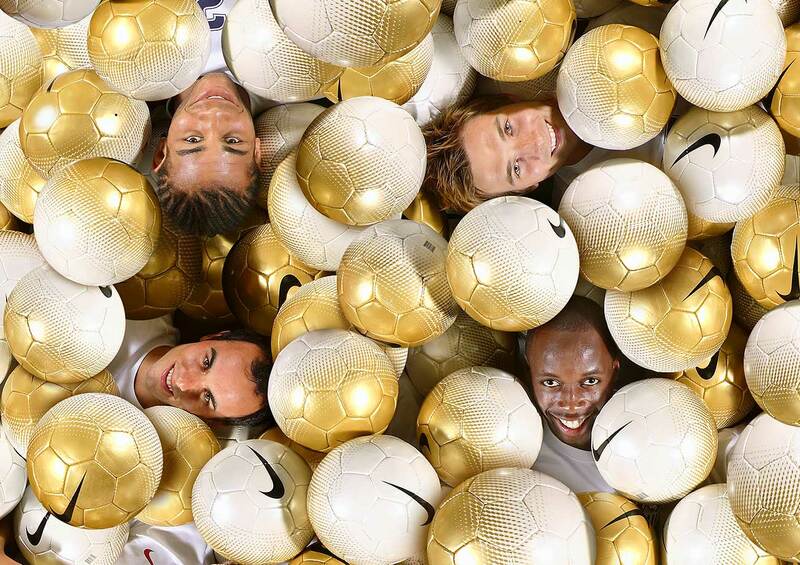 Landon Donovan with teammates Oguchi Onyewu (top, left), Bobby Convey (top, right), and DaMarcus Beasley. 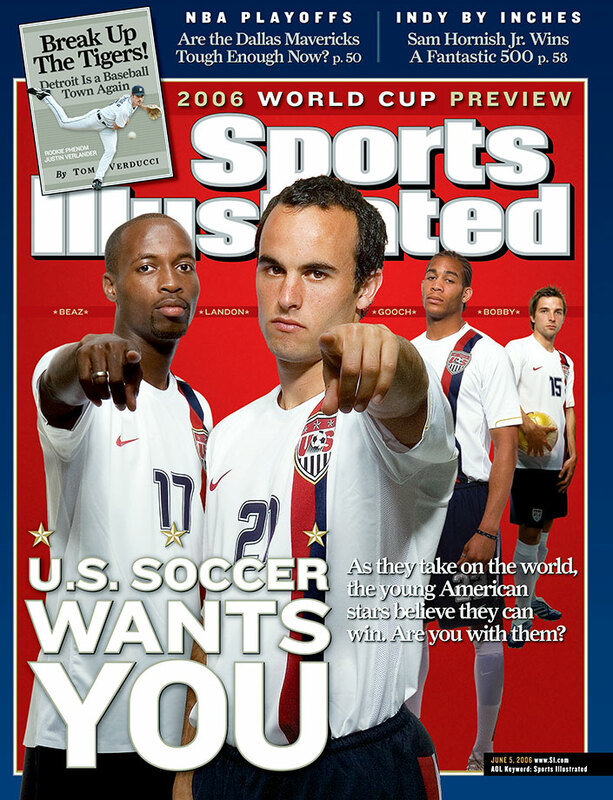 Landon Donovan, DaMarcus Beasley, Oguchi Onyewu and Bobby Convey on the cover of Sports Illustrated prior to the 2006 World Cup. 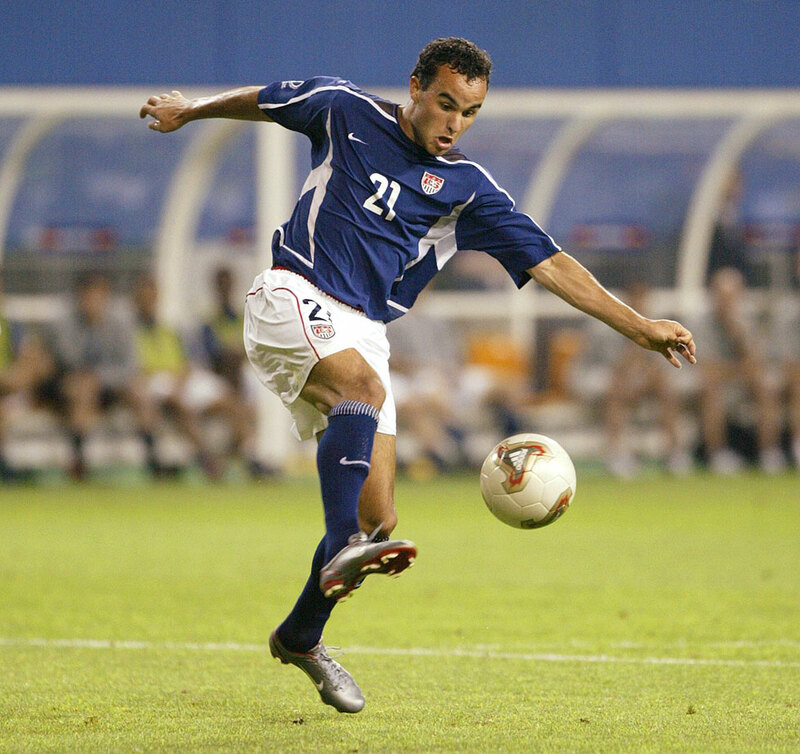 A disappointed Landon Donovan after the U.S. was eliminated from the 2006 World Cup after its third game. Landon Donovan and Frankie Hejduk parade around the field with the Gold Cup after the U.S. defeated Mexico in the final of the 2007 CONCACAF at sold out Soldier Field in Chicago. Landon Donovan receives a kiss from his mother, Donna Kenney-Cash, after winning the Honda Player of the Year Award. Landon Donovan attacks the Ecuador goal during the first half of an international friendly in Tampa, Fla. The U.S. won 3-1. 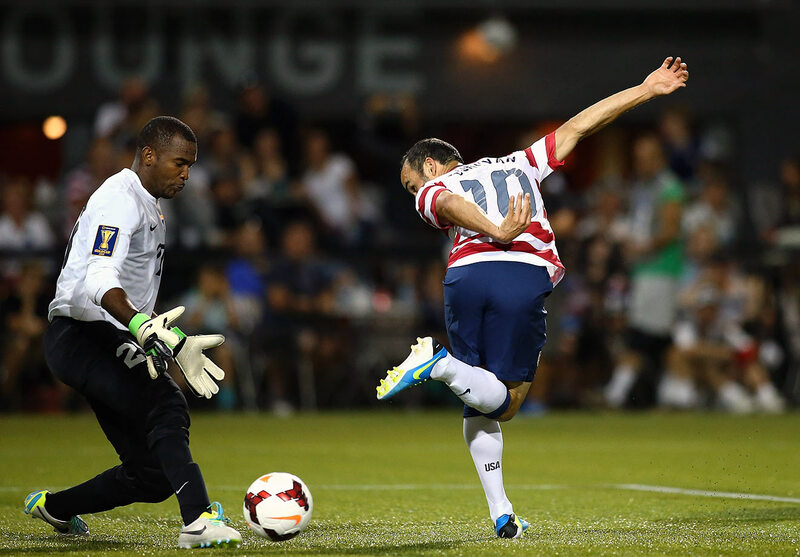 Landon Donovan clashes with the goalkeeper during a U.S. match with Cuba. 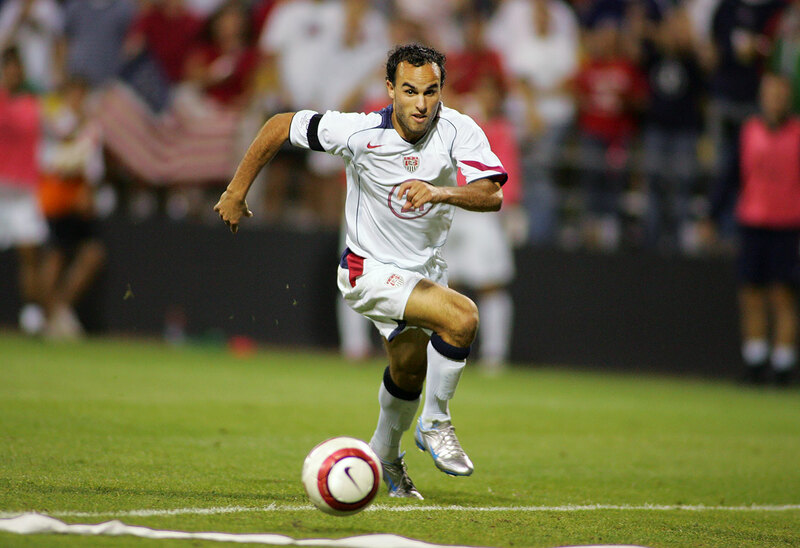 Landon Donovan heads the ball against Mexico during a 2010 World Cup qualifying match at Crew Stadium in Columbus, Ohio. The U.S. won, 2-0. A Landon Donovan assist on a goal by teammate Jozy Altidore led to this reaction during a 2010 World Cup qualifying match against Trinidad and Tobago at LP Field in Nashville. Landon Donovan and David Beckham of the Los Angeles Galaxy celebrate scoring a goal against Chivas USA during Game One of the MLS Western Conference Semifinals at The Home Depot Center in Carson, Calif.
David Beckham and Landon Donovan celebrate the latter's goal against the Houston Dynamo during the 2009 MLS Western Conference Championship game at The Home Depot Center in Carson, Calif. The Galaxy won 2-0. 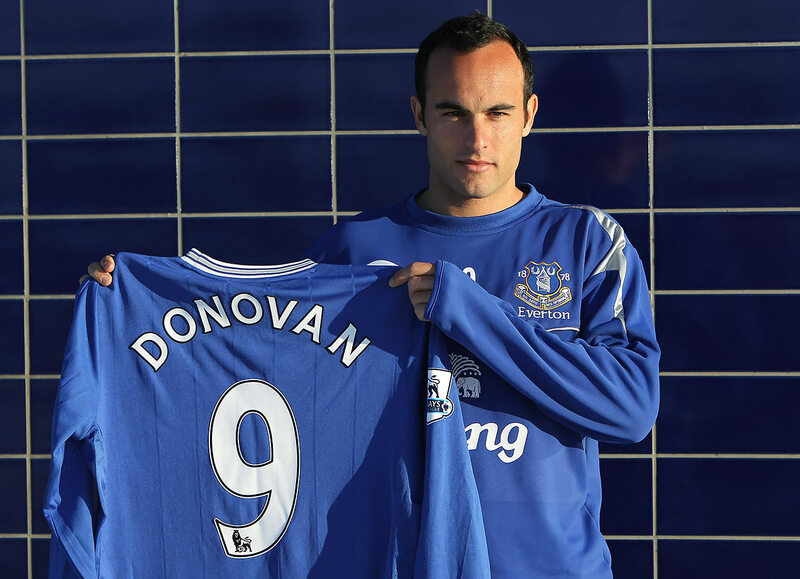 English Premier League side Everton acquired Landon Donovan on a two-and-a-half-month loan from the Los Angeles Galaxy in 2010. Matt Ryan, Derek Jeter and Landon Donovan helped launch a new razor with a ceremonial first shave in New York City. 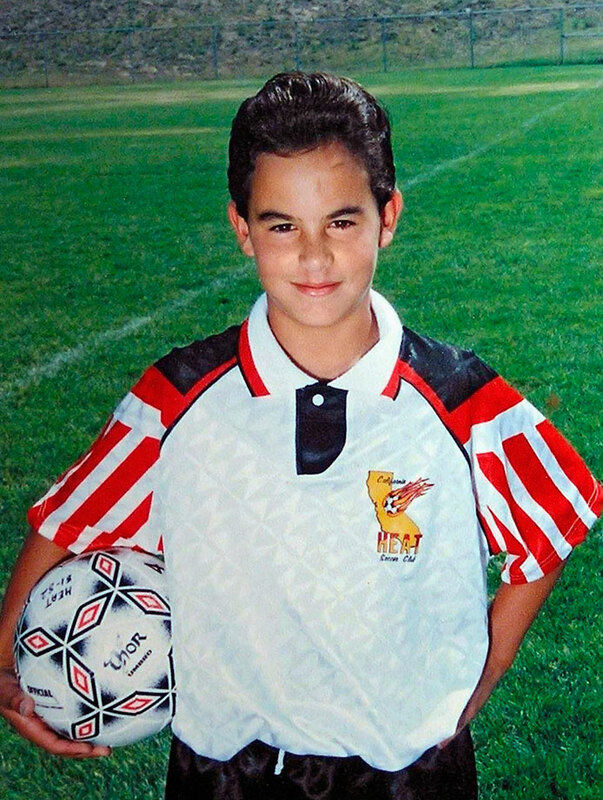 Landon Donovan during an SI For Kids photo shoot. Landon Donovan made an appearance on the Jimmy Kimmel Show, where the host had fun with a magazine spread in which Donovan was wearing patriotic underwear. 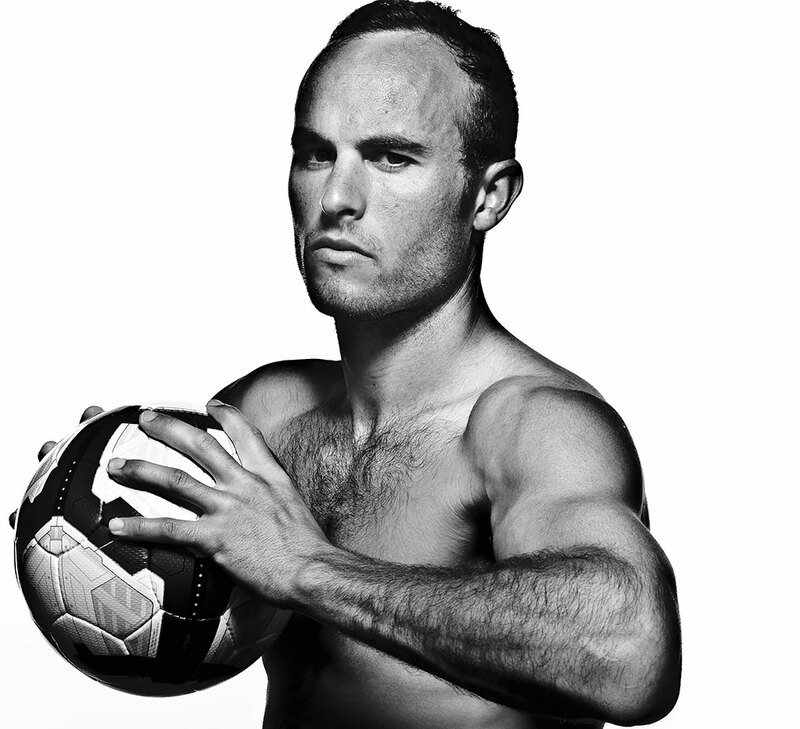 Landon Donovan poses during an SI photo shoot. 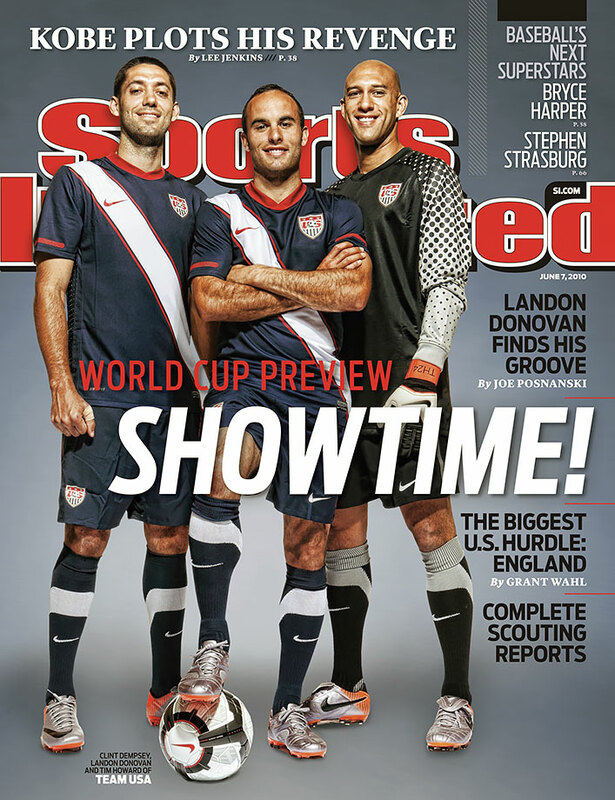 Landon Donovan poses with Clint Dempsey and Tim Howard on the cover of Sports Illustrated prior to the start of the 2010 World Cup. 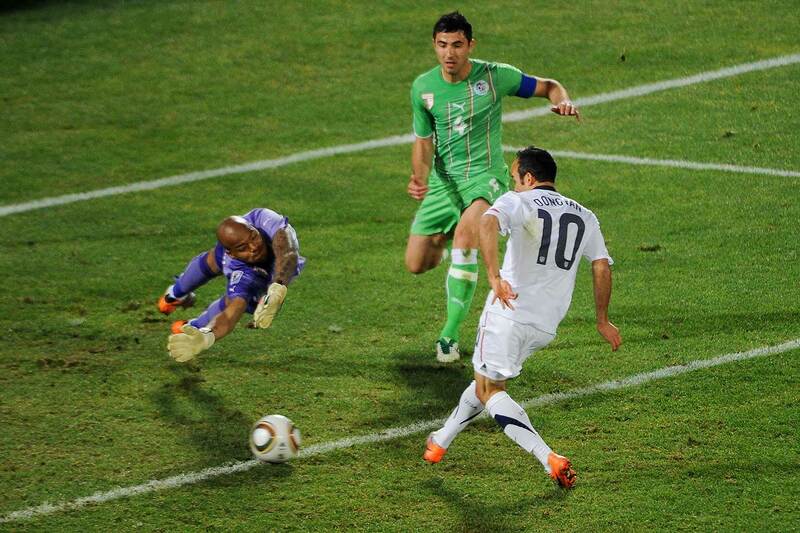 Landon Donovan shoots and scores past Slovenia's goalkeeper Samir Handanovic and defender Marko Suler during their Group C first-round match at the 2010 World Cup. 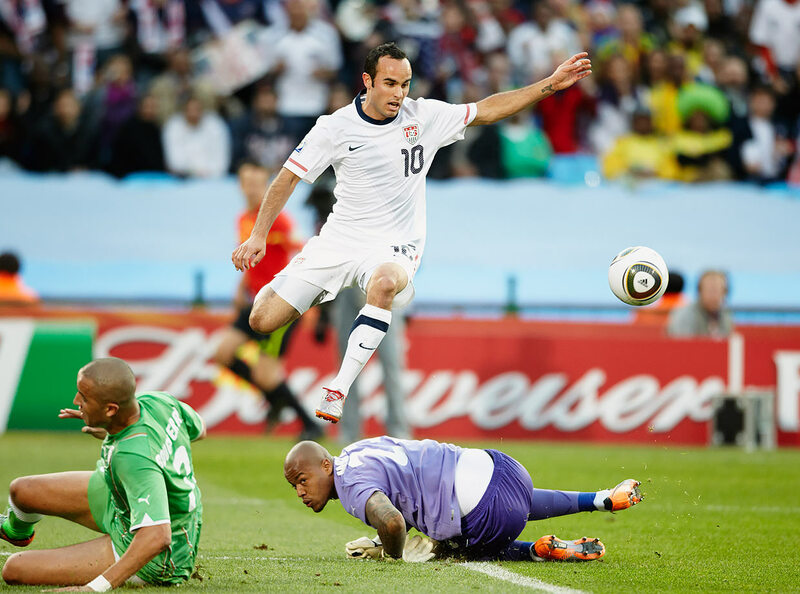 Landon Donovan jumps over the goalkeeper in the U.S. final group stage game against Algeria at the 2010 World Cup in South Africa. 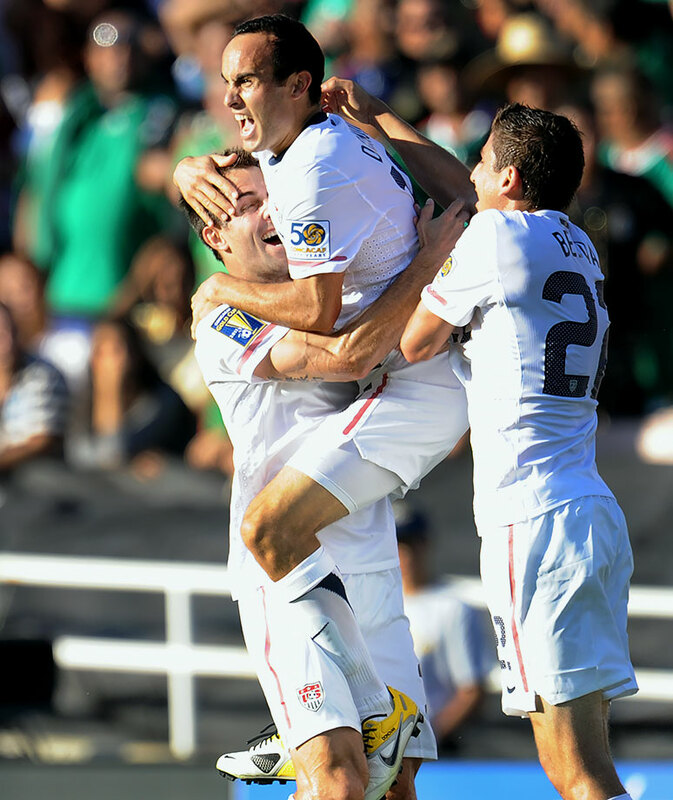 Landon Donovan scores the winning goal in the 91st minute as the U.S. defeats Algeria, 1-0. 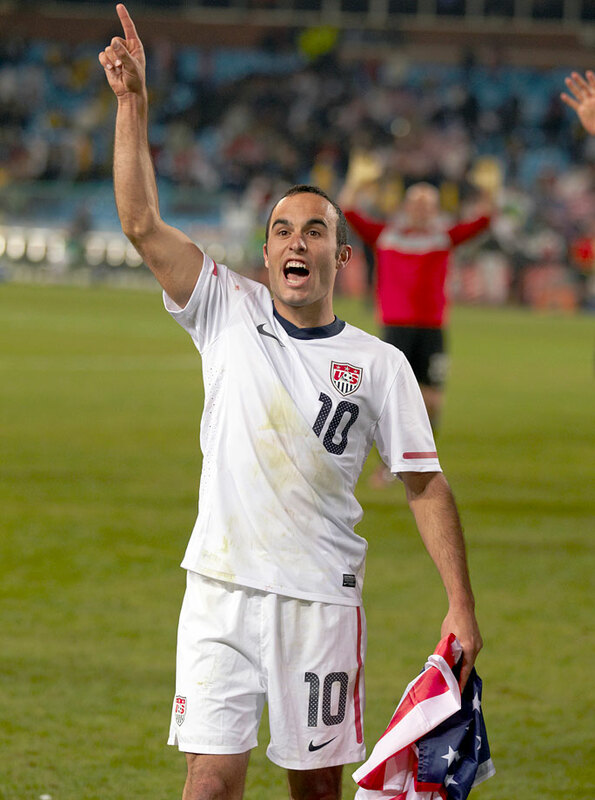 Landon Donovan celebrates after scoring the game winning goal in the 91st minute against Algeria. Needing a win to advance, the goal secured the U.S. as winners of Group C and advanced it to the Round of 16. Landon Donovan and David Letterman take turns trying to kick a ball into the open window of a taxi outside the Ed Sullivan Theater for "The Late Show With David Letterman." USA coach Bob Bradley and Landon Donovan appear on "The Daily Show with Jon Stewart." Danica Patrick and Landon Donovan pose together at the 2010 ESPY Awards in Los Angeles. Mark Wahlberg shakes hands with Landon Donovan at the 2010 ESPY Awards in Los Angeles. Landon Donovan and Serena Williams attend a Super Bowl Weekend kickoff party in Dallas. 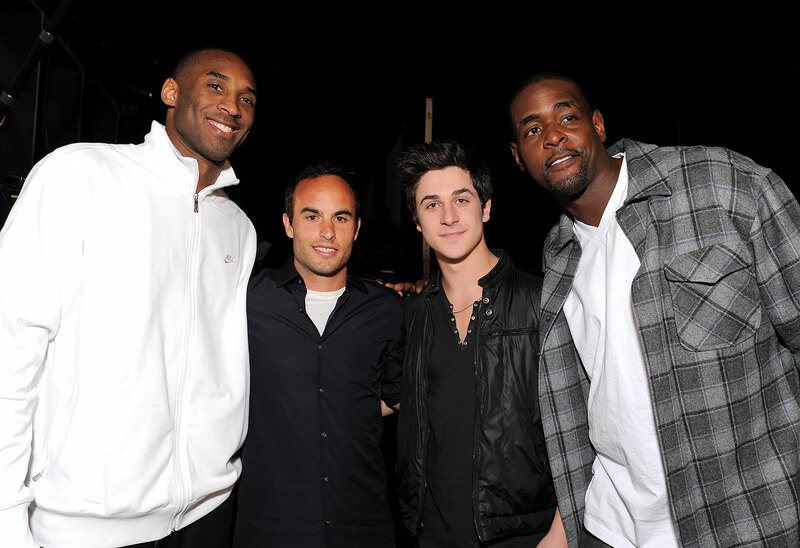 Kobe Bryant, Landon Donovan, David Henrie and Chris Webber attend the Cartoon Network Hall of Game Awards held at The Barker Hanger in Santa Monica, Calif.
Landon Donovan jumps into the arms of a teammate after scoring against Mexico in the first half of the CONCACAF Gold Cup final in Pasadena, Calif.
Landon Donovan celebrates during the 2011 MLS Cup between the Los Angeles Galaxy and Houston Dynamo at The Home Depot Center in Carson, Calif.
David Beckham celebrates with his sons Brooklyn, Romeo and Cruz, alongside teammates Juninho and Landon Donovan after the Los Angeles Galaxy defeated the Houston Dynamo in the 2011 MLS Cup at The Home Depot Center in Carson, Calif.
Indonesian students listen to Landon Donovan during a soccer clinic in Jakarta. 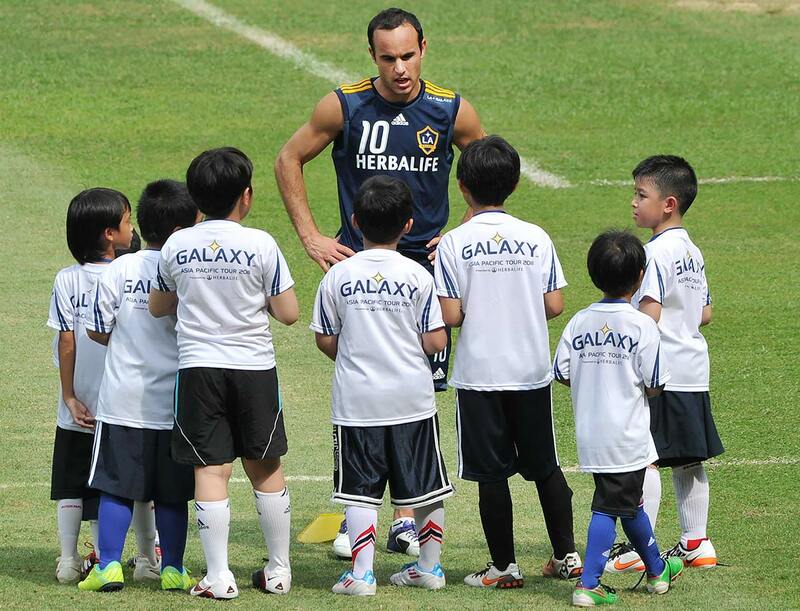 The L.A. Galaxy visited Indonesia as part of their Asia tour. 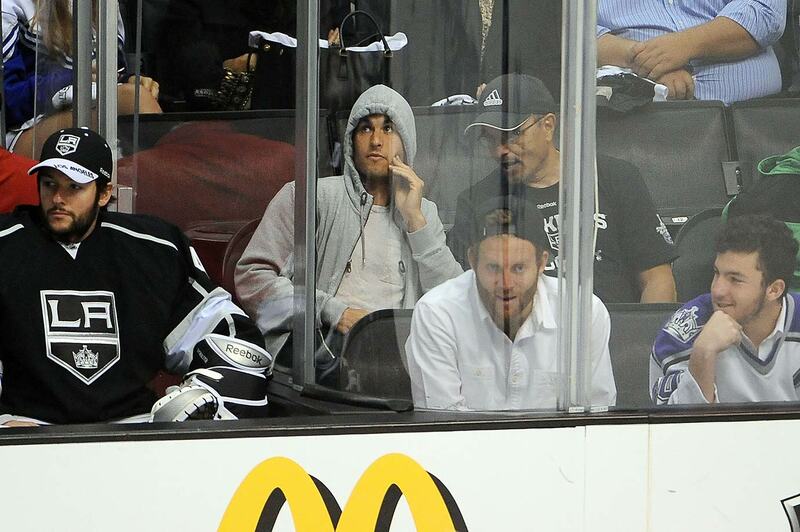 Landon Donovan watches the Los Angeles Kings and the St. Louis Blues in Game 4 of the Western Conference semifinals during the 2012 Stanley Cup Playoffs at the Staples Center in Los Angeles. Referee Silvia Reyes gets between Landon Donovan and Toronto FC's Darren O'Dea after O'Dea tripped Donovan during an MLS match. The LA Galaxy defeated Toronto 4-2. 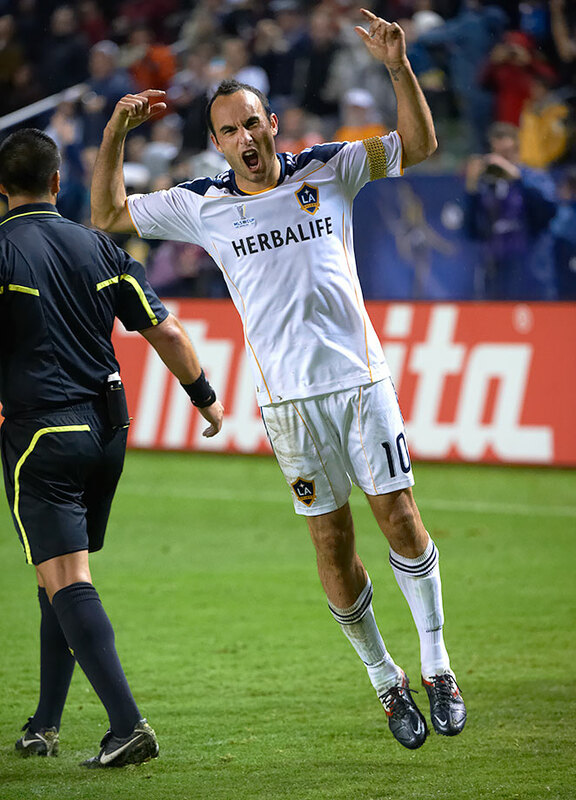 Landon Donovan reacts after scoring on a penalty kick in the second half against the Houston Dynamo in the 2012 MLS Cup. 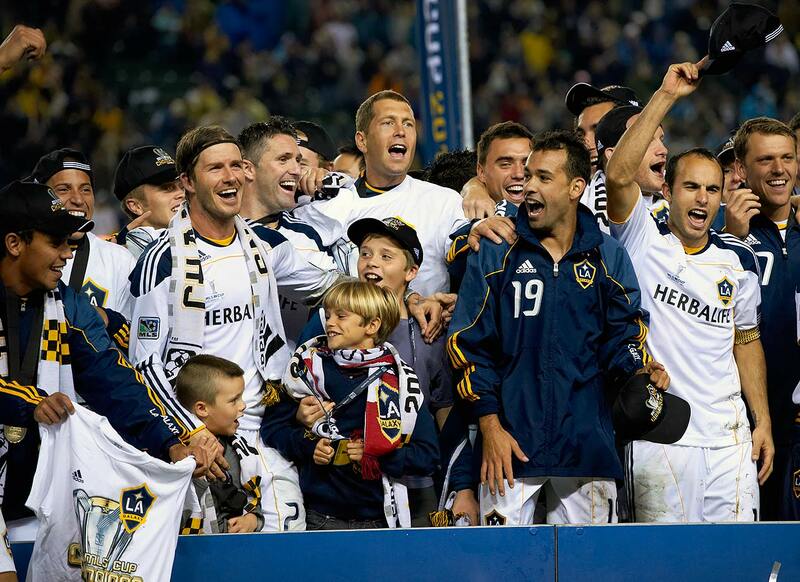 The Los Angeles Galaxy won 3-1. 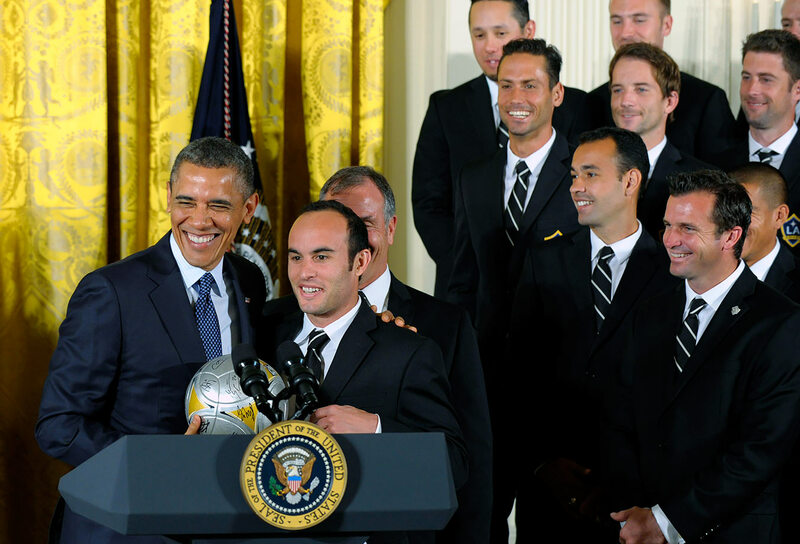 Landon Donovan kisses the MLS Cup after winning the 2012 title against the Houston Dynamo at The Home Depot Center in Carson, Calif.
President Barack Obama holds a soccer ball as he poses with Landon Donovan during a ceremony in the East Room of the White House. 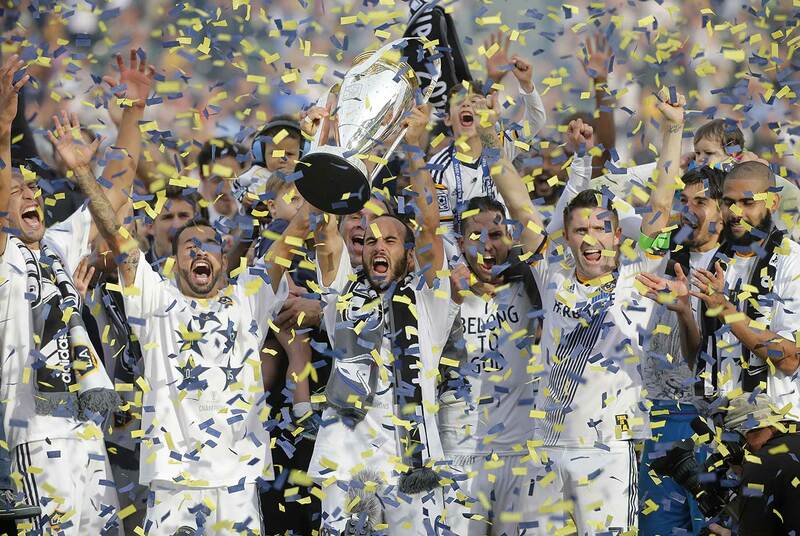 The ceremony was held to honor Los Angeles Galaxy's 2012 MLS Cup victory. Landon Donovan plays a corner kick against Toronto FC at BMO Field in Toronto. 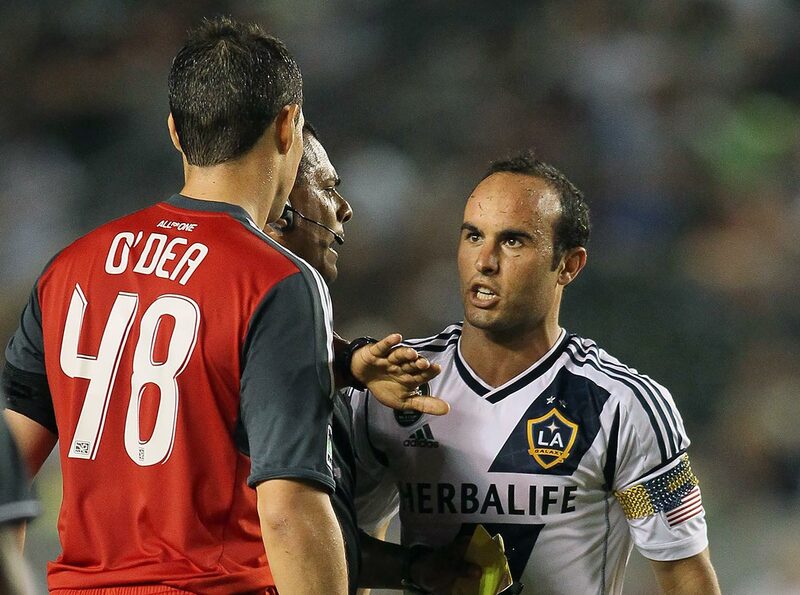 The LA Galaxy and Toronto FC played to a 2-2 tie. Landon Donovan attempts a back-heeled shot against Woodrow West of Belize during the 2013 CONCACAF Gold Cup in Portland, Ore. Donovan finished with a goal and two assists — becoming the first U.S. player to record both 50 goals and 50 assists for his career — as the U.S. won easily, 6-1. 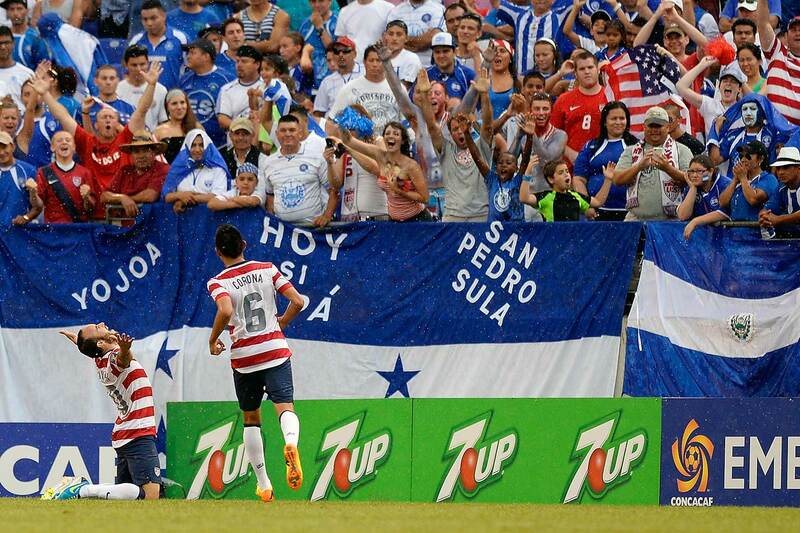 Landon Donovan celebrates after scoring a goal against El Salvador during 5-1 victory over El Salvador in the 2013 CONCACAF Gold Cup quarterfinal in Baltimore. 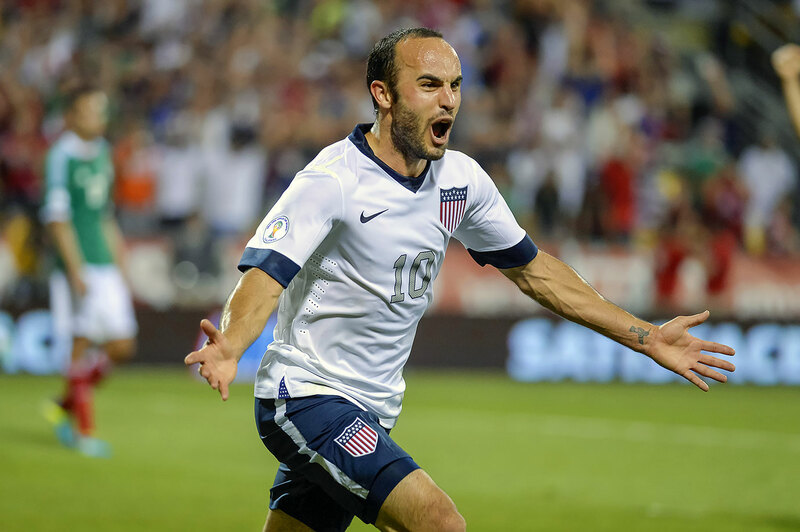 Landon Donovan celebrates after scoring a goal against Mexico in the Final Round of the CONCACAF World Cup Qualifying match for the FIFA 2014 Brazil World Cup at the Columbus Crew Stadium in Columbus, Ohio. 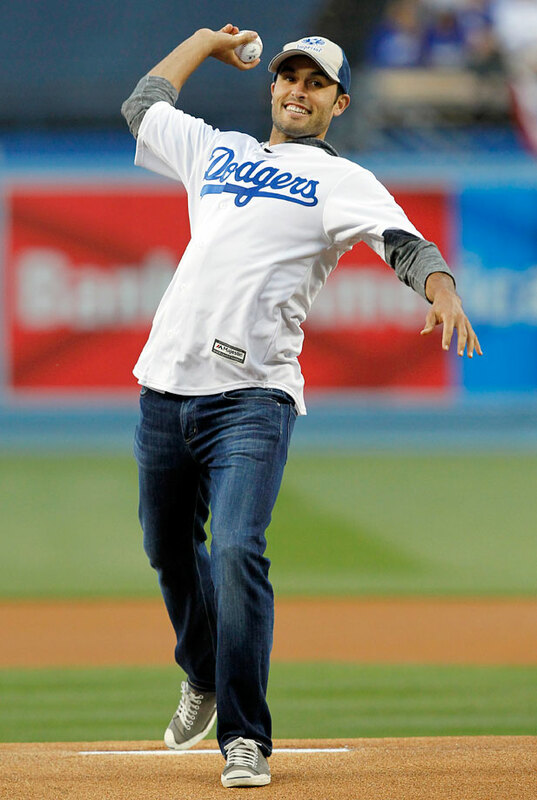 Landon Donovan hoists the trophy as he and teammates celebrate after winning the 2014 MLS Cup championship against the New England Revolution at The Home Depot Center in Carson, Calif.
Landon Donovan throws out the ceremonial first pitch before the Los Angeles Dodgers game against the San Diego Padres at Dodger Stadium in Los Angeles.